Like any good revolution, the ABM revolution has come in with a bang, smashing through existing traditions and creating a frenzied mob. But rather than overthrowing a government, this revolution has completely turned established lead generation tactics on their head, and is shaking up marketing teams from coast-to-coast. At Demandbase’s Marketing Innovation Summit, ABM was the hot topic of the show but it was different from other conferences that have been dedicated to the topic. Rather than talking about why companies should consider ABM, folks on the show floor and on stage were talking about how to implement ABM, what best practices are, and how you should consider measuring. It was clear that everyone was ready to move beyond the theoretical discussions of ABM, and get into how they could actually make it work within their existing processes and technologies. And it wasn’t just the show attendees showing increased interest in ABM. Analyst Meg Heuer of SiriusDecisions presented her findings from the 2016 State of Account-Based Marketing Study, which showed that across the board, marketers are diving head first into ABM. In fact, 27% of companies surveyed for the study are investing between 11-30% of their marketing budget in ABM, which is an increase of 19% from the number of companies who were investing that much in 2015. There was also an increase in the number of companies that have staff fully or partially dedicated to ABM, and increases in the number of companies that consider ABM extremely important to their overall marketing efforts for the year. Companies in all industries, and of all sizes, are recognizing that by aligning marketing and sales against the same accounts they can increase the efficiency of their revenue pipeline, and improve the bottom line. 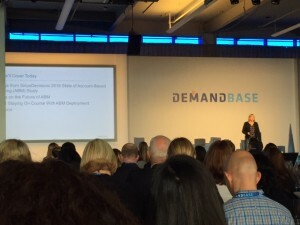 Continuing with the theme of putting ABM into action, Demandbase also launched the ABM Alliance at the conference. The goal of the alliance will be to help companies make sense of ABM, assist them in building a winning strategy and deploy the technologies needed to scale their ABM beyond the top 50 accounts, to the top 5,000 accounts in your database. But beyond just the companies in the alliance, every company that exhibited at the show is dedicated to supporting customers figure out the best way to scale their ABM efforts. If the MarTech industry can come together to help our clients target the right accounts, trigger appropriate campaigns for those key contacts, and engage them with relevant content, we’ll change the entire marketing and sales industries. 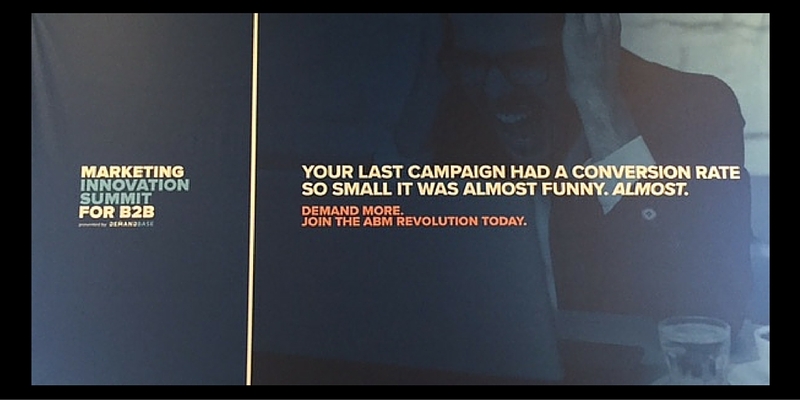 If you’re trying to revolutionize your own marketing team and implement ABM, check out highlights from the show to learn some best practices!